Cheryl Bustin is a licensed real estate agent and REALTOR in Parker Color ado. 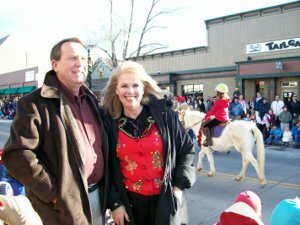 She and her husband, Bob, are co-founders of The Parker Colorado Home Center @ RE/Max Alliance. After a successful interior design career, Cheryl realized that her true love was real estate. In 2005, Cheryl's first year in the business, she was named "Rookie of the Year" in the Parker Prudential office. Cheryl's business grew from the start. Bob saw what he believed was a great opportunity. As a mortgage banker of more than 25 years, he knew combining his mortgage experience with Cheryl's interior design and real estate experience would be the perfect "recipe" for an awesome real estate team. In 2005, The Parker Colorado Home Center was created. Business was good. But, they became frustrated by the environment of real estate. Too often there were inept real estate agents, resulting in many home buyers and home sellers being under served. They noticed that with the Denver area being so large, many agents were under serving their clients by not specializing in one or a few particular markets. Most agents were trying to experts in "all markets", rather than being really expert in a few markets. It's just not realistic. It can't be done. So, Cheryl and Bob committed themselves to specializing in those areas where they lived, worked and played. From their beginnings in 2005, they have focused on their hometown of Parker and those towns within a 5 to 10 mile radius of Parker. Today, they are helping buyers and sellers in Parker, Castle Rock, Larkspur, Lone Tree, Highlands Ranch, Littleton, Greenwood Village, Centennial and Aurora. They know all of these towns, as they say, "like the back of their hands". The latest technology has always been an integral part of their business. The Parker Colorado Home Center @Remax Alliance has become a respected leader in the market. It's strong web presence is among the most widely used local real estate websites. Their latest innovation is the introduction of their Neighborhood Video Tours. Their library of neighborhood videos is a great resource for those out of state home buyers who have never visited Colorado. Viewing these videos has allowed many of their clients to identify favorite neighborhoods prior to their first home buying trip. They are the next best thing to actually being here. Finally, Cheryl has achieved some of the highest levels at Remax. She is a Remax Hall of Fame member. She is a perennial Remax Platinum Club member, among the top producing Remax agents in Colorado .